Molecular genetic testing in an individual with a suspected diagnosis of HNPCC has important implications for both the affected individual and at-risk family members. The identification of a deleterious germline mutation constitutes a genetically defined diagnosis of Lynch syndrome and is important for the treatment and subsequent surveillance of the disease. In addition, the identification of a germline mutation allows predictive testing to be performed on unaffected relatives at a relatively small cost and with essentially 100% accuracy. Thus, the identification of a germline mutation in families with suspected HNPCC is of paramount importance. Germline mutations have been identified in any one of five MMR genes in families with Lynch syndrome (http://www.insight-group.org/ and http://www.med.mun.ca/ MMRvariants/). Many different types of mutations have been detected, and they are spread throughout the length of the genes with no apparent mutational hotspots. Therefore, genetic testing is a complex, time-consuming, and expensive process. Multiple laboratories offer genetic testing for HNPCC using a variety of methods. Some laboratories begin with a more general mutation-screening test to identify the region harboring a mutation. Mutation-screening techniques are designed to screen relatively large segments of DNA for sequence changes but cannot identify the precise mutation. Additionally, the mutation-detection rate for the majority of these techniques is less than 100%, typically 80% to 90%. However, these techniques are designed to be faster and less labor-intensive than direct sequencing. Common mutation-screening techniques include conformation sensitive gel electrophoresis (CSGE),60 single-strand conformation polymorphism (SSCP),61 denaturing gradient gel electrophoresis (DGGE),62 and denaturing high-performance liquid chromatography (DHPLC).63 All these methods involve PCR amplification of the region to be screened (typically a single exon with a portion of adjacent intronic sequence) followed by electrophoretic or chromato-graphic separation of the mutant alleles from the wild-type alleles. Once a region of a gene is identified as positive by a mutation-screening method, direct sequencing of this specific region is performed. Direct sequencing of the entire coding regions of MMR genes has been another strategy for mutation detection. With the advent of automated fluorescent sequencing and the increased ability to detect heterozygous sequence changes, however, direct sequencing is now feasible and is performed in most laboratories. Both mutation-screening techniques and direct sequencing are limited by the fact that they do not detect large deletions, duplications, or other genomic rearrangements. Recent studies indicate that these mutations make up a significant proportion of mutations observed in hMSH2 (approximately 30%) and hMLHl (approximately 5-10%)66-68. Due to the preponderance of deletions and duplications, analysis by Southern blot or quantitative PCR-based methods such as multiplex ligation-dependent probe amplification (MLPA) should be part of a routine mutation-detection protocol for Lynch syndrome.69 An example of a Southern blot test for all 16 exons of hMSH2 is shown in Figure 19-3. For this specific assay,three in vitro synthesized probes (G1, G2, and G3) were constructed to clearly delineate each individual exon. mutations in the MMR genes), it is inherently difficult to determine the pathogenicity of missense changes. IHC analysis, evolutionary conservation, and the segregation of the mutation with disease within the family may all provide clues as to the pathogenicity of such mutations. However, functional assays are likely to be the most useful in the interpretation of these alterations. 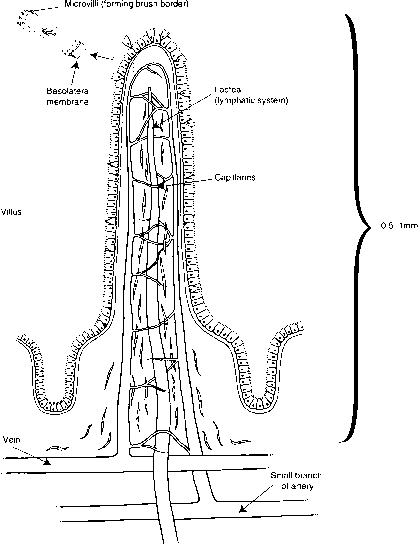 These assays have traditionally been performed in bacterial systems. Clinical utility of functional assays awaits the development of fast, inexpensive, and robust mammalian systems. Clearly the identification of deleterious mutations in families with HNPCC is an extremely difficult task due to genetic and clinical heterogeneity. Figure 19-3. Southern blot screen for all 16 exons of the hMSH2 gene. Quantitative intensity measurements are taken for all bands and are compared to a normal control. Arrows indicate some of the detected changes in band intensity due to hemizygosity. 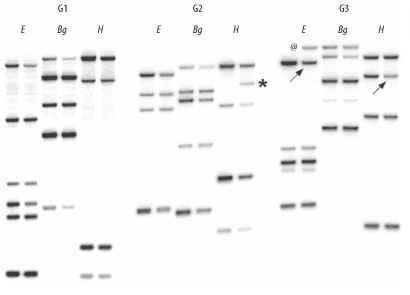 a novel restriction fragment generated by the deletion; *,an exon 8 Hind III polymorphism; G1, G2,and G3, the probe sets used with each blot; Bg, H,and E, the restriction endonucleases Bgl II, Hind III, and EcoR I, respectively.